Obtain a piece of Mexican history when you purchase a Random Year 2.5 Pesos Gold Coin from our online store today. The majority of these coins were minted with the issue year of 1945, however the series ran from 1918 uninterrupted until 1948. Displayed on the obverse is the image of a Mexican national hero; Miguel Hidalgo y Costilla and the year of issue. On the reverse you will find Mexico's coat of arms. This 90% pure coin carries a unique actual gold weight of 0.603 troy oz. Diversify your holdings with your purchase of a Random year 2.5 Pesos Gold Coin. Obverse Coat of arms of Mexico. Reverse Miguel Hidalgo y Costilla framed inside the words "Dos E Medio Pesos" and the year of issue. Coat of arms of Mexico. Miguel Hidalgo y Costilla framed inside the words "Dos E Medio Pesos" and the year of issue. 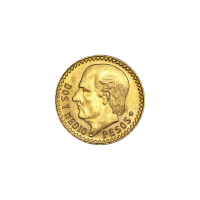 Random Year Mexican 2.5 Pesos Gold Coin Obtain a piece of Mexican history when you purchase a Random Year 2.5 Pesos Gold Coin from our online store today. The majority of these coins were minted with the issue year of 1945, however the series ran from 1918 uninterrupted until 1948. Displayed on the obverse is the image of a Mexican national hero; Miguel Hidalgo y Costilla and the year of issue. On the reverse you will find Mexico's coat of arms. This 90% pure coin carries a unique actual gold weight of 0.603 troy oz. Diversify your holdings with your purchase of a Random year 2.5 Pesos Gold Coin.